What's your excuse for hogging the middle lane? What’s your excuse for hogging the middle lane? Confessing to misdemeanours can cleanse your soul and make you feel all light and carefree again. So why not start by confessing if you have hogged the middle lane of the motorway at one time or another? 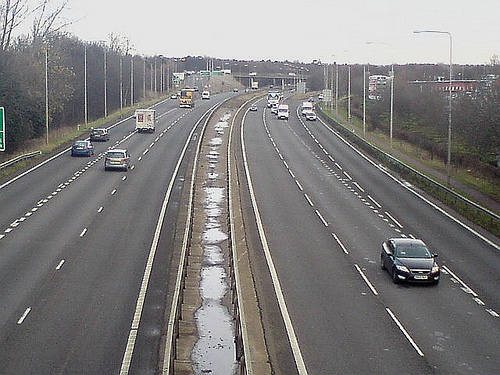 Recent research by Direct Line has revealed that 6 out of 10 UK drivers admit to hogging the middle lane. 1 in 10 of the people surveyed said that they do this regularly, even when the inside lane is clear. Why do they do this? It turns out that the most common reason given for this frankly annoying behaviour is that it is “easier to drive” in that way. Is that it? Is that the best excuse that 43% of the crazy middle lane hoggers could come up with? If we can all now drive in the way that takes our fancy then you can expect to see me scooting about completely oblivious to speed limits, traffic lights and roundabouts from now on. 38% of the hoggers said that they only do it “when the road is quiet”. Well that’s alright then, as an empty motorway means that none of the conventional rules of the civilised world need to apply, doesn’t it? Another 18% called it a “driving habit”. In total, 2,000 drivers were questioned about this way of driving and a third of the people who hog the middle lane said that they do it without realising. What do they think that empty inside lane beside them is for then? Is that only for use by insane drivers who want to drive the hard way and actually change lanes now and then? Maybe we should turn all the inside lanes in crazy golf courses if there is no point in using them anyway? Many drivers seem not to realise that middle lane hogging is now an offence, with a fixed penalty of £100 and 3 penalty points. Are you sometimes guilty of hogging the middle lane while you drive? Will your self driving car make better decisions than you? What Is the Worst Type of Driving Condition? This entry was posted in Musings, News and Views, Reports and Surveys and tagged driving habits, driving survey, middle lane, motorway driving, road safety by Robert Bell. Bookmark the permalink.